In this installment, we take a look back at past Friday postings and present our picks of some of the best video offerings. All videos involve cats, but dog lovers shouldn’t fret: your canine pals play a vital role in three of the selections…but we know you’ll want to watch them all. Cat imitates Spider-Man: A cat chases a laser-pointer dot across the floor…and up the wall. Really. Cat meets bird: A cat is amused by a small bird. Can’t we all get along? 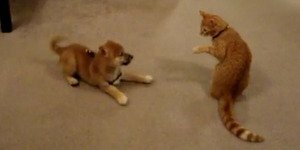 Cat meets dog: A Shiba Inu puppy invades a cat’s home. Puppy loves hugging his cat friend: A puppy can’t stop showing affection toward an older cat (who is a model of tolerance). Too many cooks in the kitchen: A puppy takes on a Bengal cat, and neither animal will back down. Dog-cat play at its finest.